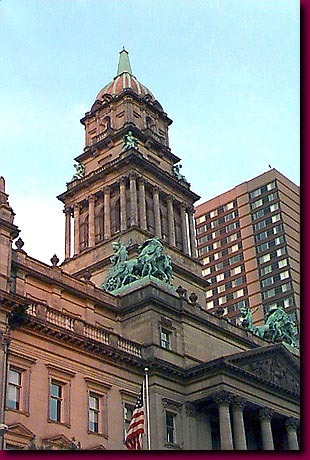 Bedecked with bronze sculptures, the 19th Century Old County Building was beautifully restored in the eighties. Once the seat of power for the City of Detroit and Wayne County, the Old County Building was woefully decayed by the 1970's. In an inspiring move it was wonderfully restored providing an example that, unfortunately, has been rarely followed.